Among the many extraordinary achievements of Srila Prabhupada was the introduction of the Ratha-yatra festival to the Western world. Ratha-yatra, or the festival of the chariots, has been celebrated in India for over 5,000 years. Every year this festival draws over one million pilgrims to Sri Ksetra Jagannatha Puri Dhama, where they eagerly participate in Lord Jagannatha’s transcendental festival, crowding to pull the ropes of Jagannatha’s, Baladeva’s, and Subhadra’s chariots or to simply view Their transcendental forms. 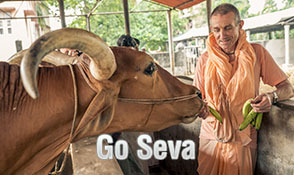 Srila Prabhupada’s influence established the Ratha-yatra celebration not only in major cities outside of India, but within India as well – and at the birthplace of Sri Caitanya Mahaprabhu in Sridhama Mayapur. The festival of Ratha-yatra commemorates the love of the Vrajavasis for their dearmost Lord Krishna. After Krishna and His brother Baladeva left Their childhood home of Vrindavana to take up the duties of kings in Mathura and later Dvaraka, Their loved ones were overwhelmed with the pain of loving separation. The residents of Vrindavana would take any opportunity to visit and see Lord Krishna. During a lunar eclipse when Lord Krishna and Lord Balarama were visiting the holy land of Kuruksetra along with Their royal families, the Vrajavasis also traveled to Kuruksetra in order to see Them. But the Vrajavasis, especially the gopi girlfriends of Lord Krishna headed by Srimati Radharani, did not like seeing Krishna in the opulent and royal setting of Kuruksetra surrounded by His ministers and queens. They desired to see Him as they knew Him, as the charming cowherd boy of Vraja. And Lord Krishna Himself, along with His brother Baladeva and sister Subhadra, was always longing for Vrindavana and desiring to return there. The unique forms of Lord Jagannatha, Lord Baladeva, and Subhadra Devi are manifestations of Their transcendental longing for Vrindavana and the Vrajavasis. The Ratha-yatra festival represents the Lord being pulled back to Vrindavana by the love of His dearmost devotees. Lord Caitanya and His associates celebrated the Ratha-yatra festival in JagannathaPuri every year. The gopis’ feelings of loving separation and longing to enjoy Lord Krishna’s company in Vrindavana are the pinnacle of love of Godhead as established by Lord Caitanya, and the Ratha-yatra festival is a manifestation of this topmost love. Following in His footsteps, devotees in the line of Lord Caitanya continue to celebrate this Ratha-yatra festival every year. Ratha-yatra is also a demonstration of the Lord’s mercy. The Lord of the Universe leaves the sanctum of His temple to go on procession and allows anyone and everyone to see His smiling face and serve Him by pulling the ropes of His chariot. For thousands of years His mercy has thus been available in Jagannatha Puri, and today, it is similarly available in all the major cities of the world: London, New York, Los Angeles, Paris, Sydney, San Francisco, Durban, Montreal, and Toronto, to name a few. In Sridhama Mayapur, a few kilometers away from the birthplace of Lord Caitanya, there is an area known as Rajapur. This place is considered to be nondifferent from Jagannatha Puri. There are pastimes linking Lord Jagannatha to this land from thousands of years ago, but approximately 500 years ago, during the time of Sri Caitanya Mahaprabhu, the Deities of Jagannatha, Baladeva, and Subhadra, who are currently worshipped in Rajapur, appeared to a devotee named Jagadisa Ganguli. 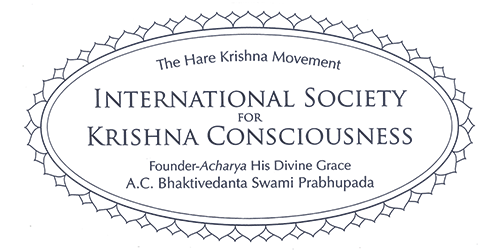 These Deities came into the care of ISKCON in 1979 after their previous caretaker, Sri Phatik Chandra Chatterjee, was inspired by Lord Jagannatha Himself to hand over the Lord’s service and worship to the devotees of ISKCON. In 1997, ISKCON Mayapur celebrated the first grand Ratha-yatra coming from the Rajapur Jagannatha Mandir to the Sri Mayapur Candrodaya Mandir. It is a festival of unsurpassable sweetness. Sri Mayapur Candrodaya Mandir is considered to be like the Gundica temple in Puri, which represents the land of Sri Vrindavan Dhama, and the devotees participating in the Ratha-yatra festival do so in the mood of bringing Jagannatha, Baladeva, and Subhadra back home to Vrindavana. 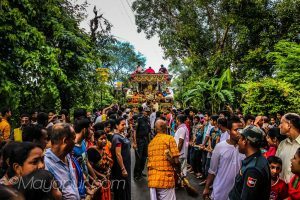 The Ratha-yatra festival is a huge event not only for ISKCON Mayapur, but for all the surrounding villages. Muslims and Hindus alike throng the streets, eager to participate. Dignitaries and celebrities come to offer their respects to Lord Jagannatha, the Lord of the Universe. At the start of the Ratha-yatra, the Deities of Jagannatha, Baladeva and Subhadra are brought to Their carts with great fanfare. Then They are welcomed opulently with the offering of many auspicious items and several dance performances for Their pleasure. Senior devotees and notable dignitaries speak in glorification of the Lord and His Ratha-yatra festival, and then the carts begin to move. Although the distance traveled by the Ratha-yatra procession is only 5 kilometers, it takes many hours for the Ratha-yatra to reach its destination. Every few meters or so, the three carts are met by devotees who have prepared offerings for the Lord and the carts halt so that the Lord can accept these offerings. Despite the heat and humidity prevalent in Mayapur in July, the assembled devotees enthusiastically dance and chant the whole way. Often, as if to soothe the devotees and enliven their dancing and chanting, the Lord sends showers of cooling rain. It is after nightfall that the procession finally reaches the ISKCON Mayapur campus. There, a temporary temple has been created to house Lord Jagannatha, along with His own kitchen. He resides there for 7 whole days, being served with love by the devotees of the Sri Mayapur Candrodaya Mandir. 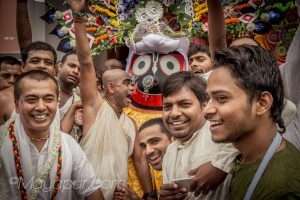 Every evening devotees gather to sing the Sri Jagannathastakam to the Lord, and they cook and bring preparations to be offered to Him. Many performances are enacted for the pleasure of the Lord and His devotees, and they attract many outsiders as well to come participate in the festivities. On the fourth day of the Lord’s stay, Hera Panchami is celebrated. On this day, Laksmi Devi along with Her guards and servants comes to Gundica to demand that Jagannatha return home. Jagannatha’s servants and Laksmi Devi’s servants have an intense fight over whether Jagannatha will stay or go back. Eventually, Jagannatha’s forces surrender and a compromise is reached: He will return after three short days. Laksmi Devi leaves satisfied to await Her Lord’s arrival. This pastime is enacted every year in dramatic style by the local devotees. Then it is time for Jagannatha, Baladeva, and Subhadra to return to Rajapur. 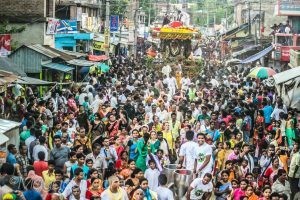 Again They mount Their ratha carts and are transported by Their devotees – this time with less eagerness, for the devotees are sad to see the Lord leave. This extensive and ecstatic festival requires an immense amount of planning and preparation. Starting on Akshaya Tritiya many months before, preparations begin. The organizers collect donations, apply for government permission, and plan and arrange numerous necessary details. Pujaris must be organized, security arranged, prasadam and drinking water obtained for the devotees, performances scheduled, potential medical needs prepared for… the list goes on. All the planning and preparation is more than a worthwhile task, and every year, the devotees who organize the festival are eager to improve and expand. Ratha-yatra is an enlivening experience for all who participate, a wonderful celebration of the Lord’s mercy and love, and His longing for His dearmost devotees.